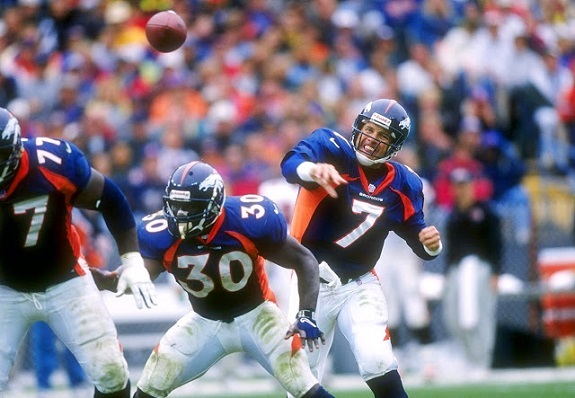 John Elway and Terrell Davis carried the Denver Broncos to two straight Super Bowl titles in the late 1990s. Some odds are out for who will win the Super Bowl 50 MVP award (Cam Newton 5/7, Peyton Manning 11/4 and Von Miller 22/1, to name a few), but my vote – if I had one – would go to Executive VP and GM John Elway if his Denver Broncos somehow find a way to win. The Carolina Panthers have already been installed as fairly heavy favorites (anywhere from 4 to 5.5 points) based on their one-loss regular season and dominance in the playoffs thus far, but Elway knows the odds-makers don’t always get it right. Eighteen years ago the defending Super Bowl champion Green Bay Packers and their dynamic young quarterback, Brett Favre, were favored to put an aging Elway out to pasture once and for all in Super Bowl XXXII. Elway was 37 years old at the time and just 19 days removed from blowing out his biceps tendon. Sounds a little like current Broncos’ QB Peyton Manning, right? Only Manning is 39 and coming off a season in which he missed six games with plantar fasciitis and threw for just nine touchdowns and 17 interceptions. Elway proved not only the odds-makers wrong in 1998, but he also silenced a lot of critics who said he’d never win the big game after being blown out in three previous Super Bowl appearances. How did Elway do it? Well, he didn’t exactly light up the scoreboard with Star Wars numbers. He went 12 for 22 for 123 yards, 0 passing touchdowns and 1 interception. Running back Terrell Davis was the MVP, steamrolling Green Bay for 157 yards and a record three rushing touchdowns. Davis also went back into the game with a searing migraine to serve as a decoy for Elway, who ran it in for a bootleg TD. But of course the signature play from that Super Bowl was Elway’s eight-yard run inside the five yard-line that ended with him diving toward the goal line only to be helicoptered through the air by multiple Green Bay defenders. If you’ve never seen that play, check out the video now. We will not see Manning make a run like that on Feb. 7 – I can almost guarantee that. Like Elway, he’ll become the oldest quarterback to win a Super Bowl if he relies on his running game and defense, because it was Steve Atwater, Alfred Williams, Neil Smith, Bill Romanowski and the rest of the Broncos 97 defense that held off a final, furious Packers’ drive for the 31-24 win. Elway did come back and win the Super Bowl MVP award the next year against the Atlanta Falcons and his old coach Dan Reeves with an 18-of-29 performance for 336 yards and an 80-yard touchdown toss to Rod Smith. He also ran for another TD in that game. In fact, Elway ran for more touchdowns (four) in the five Super Bowls he played in than he passed for (three). He also threw eight picks, and only passed for more than 300 yards twice – in the win against Atlanta and his first of three straight losses (304 yards in 1987 against the New York Giants). In the 1980s, owner Pat Bowlen had yet to figure out the old cliché that defense wins championships. The team was basically Elway and a bunch of guys who would have been second-stringers on other teams, and results were predictable when facing all-star-stocked squads like the San Francisco 49ers in 1990 (a 55-10 national embarrassment for the city and the state). Seven years later Bowlen wised up and stocked his defense through the draft and free agency and loaded up his O line with a bunch of beasts who perfected the cut-blocking scheme of line coach Alex Gibbs that ultimately prompted an NFL rule change. Enter Terrell Davis, a sixth-round draft choice from Georgia who was a wicked downhill runner with a devastating cutback ability that saw him run for 7,607 yards, 60 touchdowns and a 4.6-yard career average in just seven seasons of work before a knee injury ended his career in 2001. Recently nominated for the Hall of Fame, where Elway landed in the minimum five years after his retirement in 1999, Davis should get there this year simply based on his three-year playoff performance from 1996 to 1999. Davis played in eight playoff games, including those two Super Bowl wins, and still holds or is tied for several records with guys who played in nearly twice as many postseason games. Davis is tied with Emmitt Smith for the record for most playoff games with 100 or more yards at seven. It took Smith 17 playoff games to register that many. Davis holds the record for the most consecutive 100-plus-yard games at seven. He also holds the record for the highest average gain in the playoffs of 5.59 yards per carry, and he’s tied for the third most playoff touchdowns with 12. Smith holds the record with 19, but again, it took him 17 games. Overall, Davis rushed for 1,140 yards and 12 TDs in just eight playoff games, and he’s second all-time with seven consecutive playoff games rushing for a TD, behind only Smith and Thurman Thomas at eight. Those are Hall of Fame stats in the postseason, which everyone agrees is the ultimate proving ground. Manning on Feb. 7 will not have the same kind of line in front of him, but he will arguably have a better defense after the Broncos finished the regular season with the top-ranked D for the first time in franchise history (Carolina ranked sixth, based on yards allowed). I’ve heard talking heads on ESPN say this Denver D is geared to rush the quarterback and knock out a pure passer like Tom Brady, which is did in historic fashion Sunday against New England, and that it’s not built to contain a running team like Carolina. That overlooks the fact that Denver was third against the run this season (83 yards a game) compared to the Panthers in fourth at 88 ypg. Denver also ranked first against the pass and was the only team to hold the opposition to fewer than 200 passing ypg (199). All of that means Cam won’t find it easy-going on Feb. 7. And while the Broncos have struggled to run the ball this season, including Sunday against the Patriots, they’ve also had moments of absolutely being able to pound the rock. If Denver can avoid an early hole in the Super Bowl (and their dominant defense suggests they can), then they may be able to find some running room against the Panthers and keep Cam off the field. Arizona Cardinals rookie running back David Johnson ran for 60 yards on 15 carries and scored a TD in the NFC Championships Game – that’s a 4-yard average. If Denver’s C.J. Anderson and Ronnie Hillman can have that kind of success, it could open up some throws for Manning. And finally, if Manning struggles mightily early – as he did in his last Super Bowl appearance two years ago (safety off a botched snap and two interceptions) – coach Gary Kubiak, who was the offensive coordinator on that Elway team that won Denver’s first Super Bowl, needs to be quick with the hook and bring in proven backup Brock Osweiler. That would have been unthinkable in Elway’s day, but Manning is a shadow of his former self compared to Elway in his final two seasons, and Osweiler went 5-2 with huge comeback wins over New England and Cincinnati to help Denver land the top seed and home-field advantage. Elway has come too far at the helm of his reengineering project not to go kicking screaming in Super Bowl 50. Any signs of the 43-8 Seattle shellacking, and Elway himself should pull the trigger and bring in Brock. Because all Elway did after that national embarrassment in 2014 was ditch the league’s No. 1 offense in favor of drafting and building through free agency the league’s No. 1 defense in just two short years. That also took the foresight of firing coach John Fox, who’s coached Super Bowl losers in both conferences, and bringing in his old buddy Kubiak and, more importantly, defensive guru Wade Phillips – the team’s former head coach who was booed out of town. Teams with the No. 1 defense during the regular season are 9-2 in the Super Bowl compared to a 9-10 record for teams with the No. 1 offense. Elway learned that lesson in his playing days, and he quickly learned it again in his days as one of the league’s best executives. That’s why I’d give him his second Super Bowl MVP award if his team wins its third Lombardi Trophy. I forgot about that torn bicep of Elway’s. Lingering injury or not, I think Peyton’s going to have to throw to win this one.